Started this discussion. Last reply by 4-LAN Sep 30, 2018. Started this discussion. Last reply by albertasequeira May 18, 2018. Started this discussion. Last reply by william sawyers Aug 2, 2008. Started this discussion. Last reply by 4-LAN Jul 26, 2016. 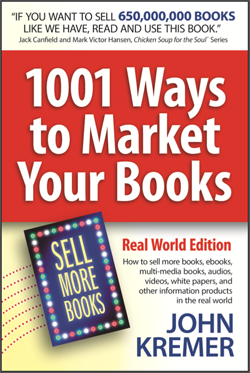 John Kremer is the author of 1001 Ways to Market Your Books, webmaster of BookMarket.com, and founder of the Book Marketing Network. In addition, he is the webmaster of AllBooksFree.com, FreeBooksForAll.com, and MyIncredibleWebsite.com. He is also the blogger at Book Marketing Bestsellers. You can sell holiday-related books to Christmas stores. Here's one: International Christmas Market, 4423 220th Trail, Amana IA 52203; 319-622-7650. Web: http://www.amanageneralstore.com. Thank you so much for the Book Marketing Network. I'm adding links to your website from my own. Hopefully my meager addition will drive more authors and readers your way! I need help in entering my book cover and info on the Network. Can you HELP? the discussion is going well and, as I anticipated, the topic is turning more towards indies getting their books noticed. I brought over new member, Ian Murray-Watson, from Goodreads. He has many questions in this area. Since you are the book marketing expert, I was hoping you could drop by again and maybe offer a few words of encouragement to Ian and the rest of the gang. Hi John, hope you can stop by and post a comment on this week's book review. Here's the link. John, I hope you have been doing well. If you have the time could you please follow the link below and help us congratulate fellow indie and member of The Book Marketing Network, Mr. Martin Murphy, on having his novella featured on today's Sunday Showcase of Indies Unlimited. Hi John, hope you are doing well. I posted another book review. Hope you can follow the link below and say hi to everyone. John, I am still promoting your site. Just posted another review. Maybe you can make an appearance.